Published: February 13, 2019 17:08 Pratyush Sarup, Special to tabloid! On an average, we will spend over 90,000 hours at work over our lifetime. As the International Director for Ideation at Haworth, the leading international designers and manufacturers of adaptable workspaces, Brendon Bruce’s research and insight into the evolution of the workplace impacts how we experience our environment for this significant chunk of our day, and life. Exclusively for Gulf News tabloid!, Bruce shares the key movements that will impact workspace and workplace design in the immediate future. As Gen Z hits the job market, hiring, management practices, and the office as we know it are changing dramatically. GenZers are looking to have fun at work, but they also want to work hard and do a good job. Culture fit is the most important thing to them. The Water Cooler: Creating a “water cooler” space nudges workers to take short breaks throughout the day to encourage movement, hydration, and social connection. Staying hydrated improves focus, while the spontaneous human interaction builds team relationships that spark conversations, creativity, and innovation. 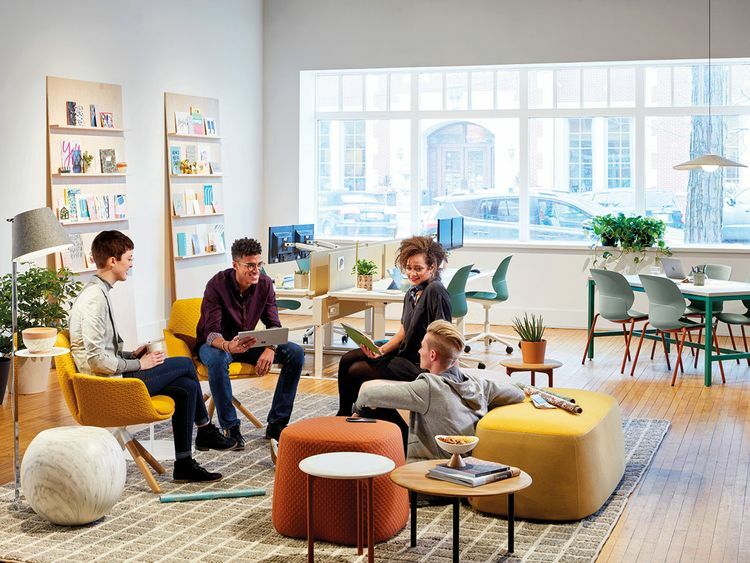 Personable Spaces: People like — and are willing to invest more time when they feel their immediate environment reflects their personality and experiences. Workplace designers and business owners need to leave room in the office for the staff to put their stamp on. Be it one’s divider panel, as has been de rigueur, or a community space that allows people to relax, even play video games and generally chill. Some firms are even investing in sleeping rooms, and quiet rooms for personal calls. Change in how we work today and who we hire is reflected in how design the office. Good design supports well-being of the user; it’s not surprising then, employees consider thoughtful design as a perk. 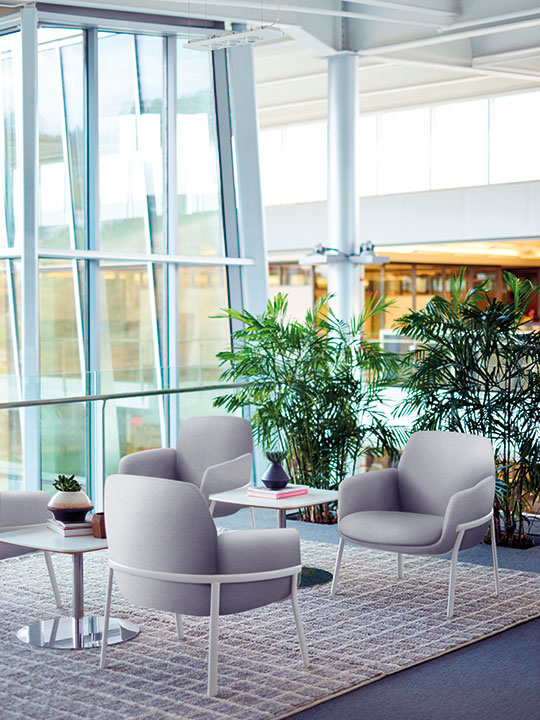 Natural Light: According to a recent market studies, employees say that natural light and outdoor views improve their overall happiness and well-being, work satisfaction, work performance and organisational commitment. With that in mind, think about how you would like to utilise the windowspace available to your office. New design thinking has turned the corner office on its head, organising, service areas, meeting rooms and closed office closer to the internal core of the site, so that more people can get more natural light and views. Nature Comes Inside: We’ve seen the growth of outdoor workspaces. Still, 90 per cent of our time is spent indoors. With that in mind, living walls of plants and greenery, furniture reminiscent of the outdoors, and materials like wood and stone are being used in interior design to create inspiring environments that help people feel relaxed, so they can focus on their work. From flooring that can mimic natural elements such as wood, grass, even cobble, to furniture that eschews metal in favour of wooden elements and plush upholstery that veers more towards handicraft than synthetic fabrics, there is a gamut of solutions to bring nature inside. If all else fails, appoint lush, oversized indoor plants in artisanal pots to blur the lines. It’s long been the invisible backbone of the office, but now, with the advent of diverse work cultures and off-site work gaining momentum, technology is at the fore of the new-gen work experience. Podcast Days: As an efficient way to absorb information while multitasking and on the go, podcasts have become an essential learning source for busy entrepreneurs and leaders. Content from business experts, and other leaders are available on demand, offering guidance and input anytime, while leaving listeners free to go about their business. The office’s IT should be equipped to provide staff the necessary infrastructure that goes beyond secure mail and adds value to their day. Alexa? Siri? Cortana? Today, we can turn off lights, lock the door, check our schedules, and more — all with a simple command. Now, companies are using this type of AI technology. Voice activated collaborative technology is helping at-home workers feel more connected. And, this is just the beginning.